PVC Liners | GeoCHEM, Inc.
Poly Vinyl Chloride (PVC) is the most commonly specified lining material in the industry. Manufactured by the calendaring or extrusion process, it is a highly flexible, non-reinforced, cost-effective, waterproofing geomembrane with many uses and advantages. PVC has high puncture strength and excellent abrasion resistance. It is resistant to a number of industrial chemicals. Because of its high flexibility, PVC liners readily conform to sub grade contours and offer excellent interface friction without being textured. The use of a PVC liner prevents contaminants from entering groundwater sources or streams. In addition, it conserves potable water resources by preventing seepage loss. PVC is available in a variety of formulations including fish grade and oil resistant. It is available in 20 mil, 30 mil, 40 mil and 60 mil thicknesses. Factory fabrication eliminates up to 88% of field seaming. PVC can be fabricated into panels up to 40,000 square feet in our climate controlled manufacturing plants and then shipped to the site for installation. Using pre-fabricated panels makes it possible for crews to install acres of lining per day and reduce overall construction time. CLI can custom fabricate panels to fit site specific dimensions and requirements, and will provide its customers with detailed panel layouts for ultimate placement. Panel sizes are often determined by the material weight and site conditions. PVC supports diverse field seaming capabilities (thermal fusion by hot air wedge welders or chemical adhesives). Now, with advanced technology in field welding, the use of wedge welders that apply heat and pressure to form a homogenous weld are becoming the state-of-the-art. Wedge welding provides excellent seam properties and reproducible welds and is faster and cleaner than solvents. 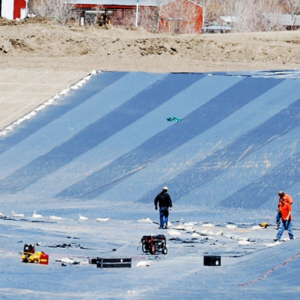 A PVC liner can be easily installed by unrolling and unfolding the liner into the pond and seaming the panels using adhesives or wedge welders. Your liner can be installed using customer provided labor and a CLI supervisor, or in a turn key installation provided by one of CLI's professional, certified crews or affiliate installers. Since PVC is degraded by sunlight; it requires being covered with a minimum of 12" (1 foot) of clean fill to function as designed. In prolonged exposure to sunlight, PVC must be covered before warranted for life span. In buried applications, PVC can provide a service life of over 20 years. Slopes should be limited to 3:1, and cover soils should be walked in from the bottom of the pond to the top, always keeping a minimum of 12" of clean soil between your equipment and the membrane. For larger ponds and lakes, consideration for erosion and wave action should be taken into account. The use of rip-rap, concrete shore protection or synthetic erosion control protection is highly recommended.